Every time I go to the Washington State Fair I always eat a caramel apple. I love oatmeal cookies. 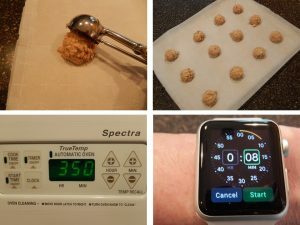 So, I combined 2 great flavors into my Salted Caramel Apples Oatmeal Cookies. 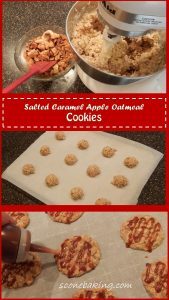 There is oatmeal and dried apples in the cookies with a delicious salted caramel sauce drizzled on top. In a heavy-bottomed saucepan, combine the sugar and water over medium-low heat until the sugar dissolves. Increase the heat to medium high; bring to a boil, without stirring. If necessary, use a wet pastry brush to wash down any crystals on the side of the pan. Boil until the syrup is a deep amber color, about 5 to 6 minutes. 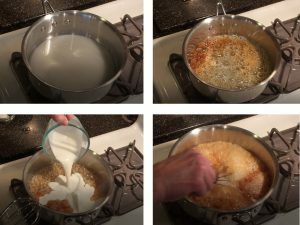 Remove the syrup from the heat and carefully pour heavy cream into boiling syrup (this mixture will bubble), then whisk to combine (mixture will seize if you put the whisk in before the cream, if this happens add 1 Tbsp light corn syrup and stir like crazy until smooth). Stir in the butter and kosher salt. 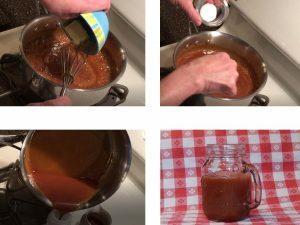 Transfer the caramel to a squeeze bottle, cool. You will use about half of this sauce for the cookies. The sauce will keep in the refrigerator for about 2 weeks. NOTE: The Salted Caramel Sauce can be made a day or so ahead. Preheat oven to 350 degrees F. Cream together butter, yogurt, brown sugar, and caster sugar; then add eggs and vanilla. 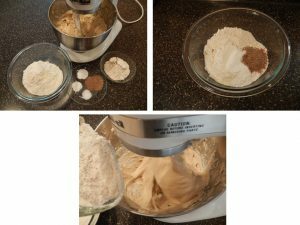 In a small bowl combine flours, flax meal, baking soda, baking powder, and salt. On low speed slowly add flour mixture until well blended. Mix in oatmeal. 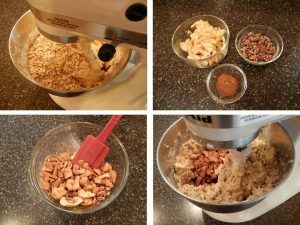 In a small bowl combine cinnamon, apples, and pecans; add to oatmeal mixture, blend well. 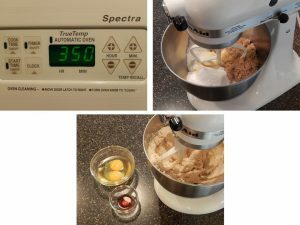 Drop, using a 2-Tbsp cookie scoop, 2-inches apart on parchment lined cookie sheet. 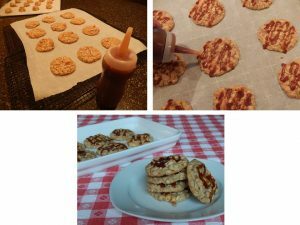 Bake for 8-11 minutes at 350 degrees F.
After cookies have cooled 5 minutes, drizzle with caramel sauce.